When you're on a road trip, how often do you check the gauges on your car’s dashboard? Routinely, if you're like most people. Those indicators tell you important information like where you are in your journey, how you’re tracking relative to expectations and whether you have enough fuel to get there. Your finance dashboard serves the same purpose for your business. It should display the most critical indicators of your company's financial performance and help you clearly see if you're on track toward achieving your goals. But not all dashboards are created equal. Consider these essential features if you want a finance dashboard powerful enough to help you steer your business. Every metric in your finance dashboard should be derived from quantifiable data you are monitoring. Your dashboard should be supported by detailed financial reports that can be readily accessed when questions require a deeper dive in specific areas. For example, if your cash balance is projected to drop in 4 weeks, you should have the specific assumptions surrounding inflow and outflows that led to that projection. While it may seem obvious a dashboard should be based upon reliable data, our experience is that most small business owners have lost confidence in the accuracy of their financial reporting. The data in your dashboard must be produced from an accounting process with documented, standardized procedures and tight internal controls. Accurate underlying data is the cornerstone of confident, informed decisions. Just as your car can overheat after 3 hours in bumper to bumper traffic on a hot summer day, your business is dynamic and subject to ongoing threats and opportunities. Your dashboard should be prepared at least monthly to ensure you can react to negative trends before they’ve taken their toll. You’ll also want to seize opportunities early to maximize their potential. As an example, if your dashboard monitors trends in revenue (or profit) by service offering, you’re must more likely to stem a sales decline or steer more sales and marketing efforts to double down on a more profitable line. Your business isn't generic and your finance dashboard should not be either. The key performance metrics it reports upon should be customized to your company, factoring in your industry, stage of growth and short & long-term goals. Whether that means ensuring you have sufficient cash to afford that next hire or new technology investment, it should provide answers to the questions most pertinent to your current key decisions. The whole point of a finance dashboard is to reveal the metrics most important to you, at a glance. Its purpose is to fuel fast, efficient and informed decisions. To achieve this, the data must be presented in a format that speaks to YOU, that is optimized for how YOU most readily consume data (likely some mix of visual graphs over tabular presentation). You don’t have time to analyze your dashboard, a finely tuned dashboard lets you grab the info you need and go. 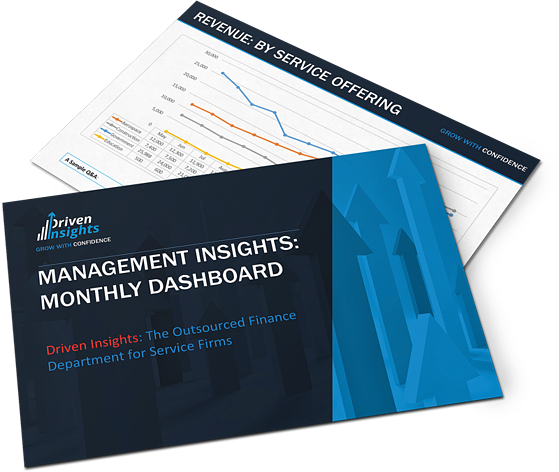 An effective finance dashboard provides visibility into key performance metrics that should spark questions. These questions, in turn, should spur decisive action. It’s only through these questions that you will discover problems and opportunities in your business. In either case, quick action is critical; hence the need for dashboard data that can be comprehended instantly. Your company and its market are dynamic, both constantly evolve. Your finance dashboard should be adapted accordingly to ensure the metrics remain relevant. Ensure your team is adapting your reporting to remain a step ahead of your needs. A powerful finance dashboard provides game-changing insights, at a glance. Does yours make the grade? Driven Insights serves an outsourced finance department for service firms. We take the time to understand your business and develop the systems that produce the ongoing reporting required to help you drive your company toward your goals. We're in the business of making great dashboards. Email info@driveninsights.com or call 888-631-1124 to find out how outsourcing your finance function to Driven Insights can accelerate your growth and help you build the type of value the market will ultimately reward.